One great thing about having my in-laws visit is that I always pick up a few delicious Middle Eastern style recipes that taste like I’ve spent hours cooking them, but are actually quite simple. This Moroccan Apricot Chicken Recipe is just that. The chicken is fall-off-the-bone tender and is unbelievably moist and juicy. It’s rubbed in a combination of spices, seared, and then braised to perfection in the most delicious sauce. And it’s all done in one pot (you know I love those one pot meals)! This chicken turns out perfect EVERY time I cook it, and it’s become a staple for dinner parties or big family dinners. Serve over rice or couscous, along with some roasted veggies or salad for a complete meal. Enjoy! With the flavors of a scrumptious chicken tagine, this dish will melt in your mouth. 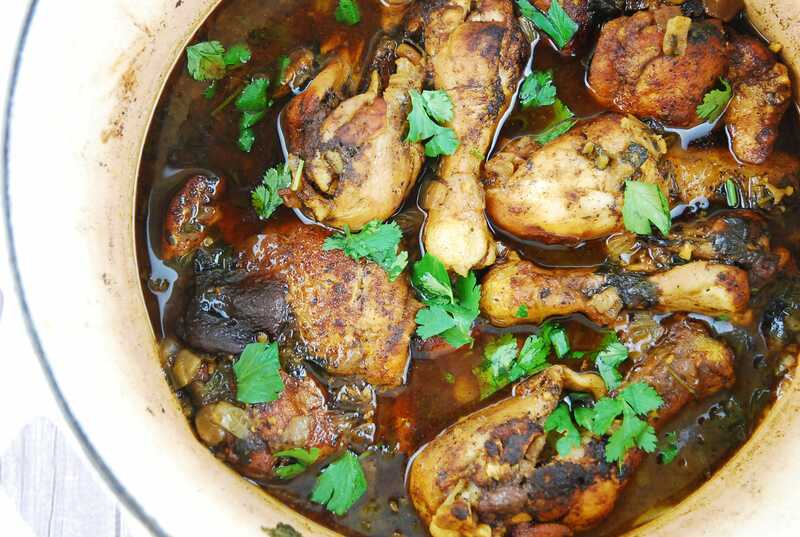 The most tender, moist chicken you can imagine braised in a beautifully simple sauce that’s wonderfully flavorful. In a large bowl, mix the cinnamon, ginger, cardamom, turmeric, paprika, salt, pepper, and olive oil. Add in the chicken pieces and toss well to coat. Mist a large pot or Dutch oven with cooking spray and set over medium high heat. Add chicken (in batches so as not to crowd the pan), and brown on all sides (about 4- 5 minutes per side). Remove cooked chicken and set aside. Add onion and some salt and cook uncovered, stirring frequently, until soft, about 5-7 minutes. Add garlic, cilantro, and parsley to the pot. Then add broth, honey, apricots, chicken, and any juices accumulated on plate. Reduce heat to medium low and simmer, covered, 30 minutes. Do you have the Smart Points Value for this recipe? It looks amazing!!! !